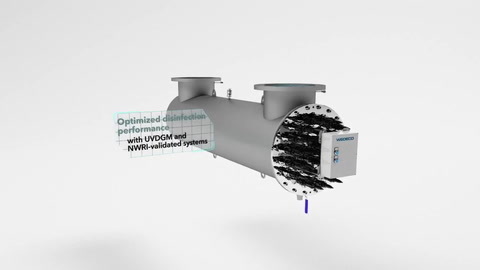 Xylem's Wedeco LBX Series is a proven, energy-efficient UV solution for the disinfection of wastewater, water reuse, surface water, process water, and other low UV transmittance liquids, whenever a closed-vessel UV system is preferred. The LBX series has demonstrated its ability with more than 1,000 installations worldwide for various wastewater, water reuse, drinking water, and industrial applications. LBX UV systems have been extensively tested to meet the U.S. Environmental Protection Agency’s UV Disinfection Guidance Manual (USEPA’s UVDGM, 2006) and the National Water Research Institute (NWRI) guidelines, meeting the most stringent California Title-22 Water Reuse standards. The extensive validation allows for proven disinfection performance over a wide range of UV transmittance (UVT) values and a variety of target organisms including Adenovirus. Additionally, OptiDose, the sensor-based, real-time dose control, monitors operating conditions, including flow, UV transmittance, and UV intensity. Then, with proven control logic, OptiDose adjusts the energy consumption to the minimum needed to meet dosing requirements. No assumptions are made regarding process parameters, ensuring cost savings and disinfection confidence at all times. The LBX UV system's automatic wiping system works without chemical cleaning additives. The Ecoray lamps used by the LBX Series have reduced mercury content and consume less energy, further reducing the carbon footprint. 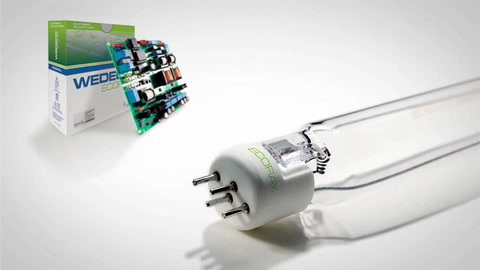 For improved economics and maximum sustainability, Xylem's Wedeco LBX UV systems employ low-pressure, high-output, amalgam Ecoray UV lamps and ballasts. Used in combination with the variable power option, the Ecoray technology results in excellent energy efficiency under all operating conditions. Particularly in dimmed mode, they realize average energy savings of up to 20% compared to existing technologies. Furthermore, L shape units feature the patented OptiCone flow diverter which maximizes the hydraulics. The LBX Series offers various sizes (13 x CE, 9 x cUL standard), allowing the best design tailored to the desired flow range. Alternative U, Z, and L-shaped reactors, along with DN or ANSI flanges, maximize the flexibility to fit in site-specific piping schemes. For L-shaped systems, the patented OptiCone flow diverter improves the overall hydraulics and makes the impact of inlet piping conditions negligible, thereby simplifying installation requirements. In addition, the systems can be installed indoors or outdoors, and in various orientations (horizontally, vertically, outlet flange rotation). With various control modes, cabinet types, and SCADA communication types, the LBX Series is easily customizable to match specific site requirements. The control cabinet can be placed indoors or outdoors as well, even at high ambient temperatures, with an optional stainless steel enclosure and air conditioning. The Wedeco LBX Series UV system maximizes operator usability with minimum maintenance. The EcoTouch controller unifies all sensor signals, alarms, SCADA connectivity, and OptiDose closed loop control for easiest monitoring and control. An automatic wiping system keeps the sleeves clean, minimizing manual cleaning effort, and Ecoray UV lamps come with a 14,000 h lamp life guarantee, reducing lamp maintenance. Reactor length (m / in) approx.